Am I the last person to read the Mars trilogy? Yes, Kim Stanley Robinson’s Mars trilogy (Red Mars, Green Mars, Blue Mars) has been out since the early ’90s, but somehow I’ve been under a rock (cough, graduate school) and not managed to pick up on this series until Brian brought it home from our favorite little SF&F bookstore. And I’m amazed how well this trilogy fits into my current thinking about ecology and virtual environments. Why couldn’t I have read these back when I was first writing about Spore and the absurdity of terraforming alien planetoids with lasers, tractor beams, and magical U-Built-It kits? I’m consistently amazed by the level of technical detail Robinson crams into these books, and the sometimes excruciatingly precise description of Martian geography. Here is a series that tackles global warming on not one, but two planets, takes nuclear energy and radioactive fallout in stride, but stops regularly to coo over salt-tolerant lichen and, well, dirt (ok, regolith). I’m not sure yet what I think about Hiroko, the “farm workers,” and the mysterious will to life that Robinson dubs “viriditas” (how does this compare to Bruce Sterling’s Viridian?). I’m a little tired of woman being identified as the all-mother/goddess/planet, let alone an Asian woman (a.k.a. Why does the Japanese lady have to strip for every public gathering?). Robinson lives in Davis, CA. Who knows? I might get to ask. Read Red Mars earlier this year, still haven’t found time for Blue and Green. You’ve made me decide to pick this up again. I can understand why you stopped after Red Mars, as the first book was a little overwrought. 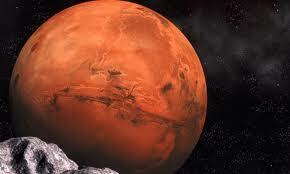 Green Mars had a more settled pace and deeper characterization. I’ve had the Mars trilogy forever! I did pick up “The Years of Rice and Salt” and his more recent trilogy 40/50/60 set in DC and dealing with climate change, so Kim Stanley Robinson is back on the front bookshelf. “Am I the last person to read the Mars trilogy? more of your posts. Time to spend a lot of time online lmao.